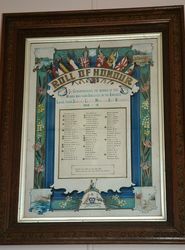 A framed paper honour roll commemorates those from Sisters Creek, Myalla and Boat Harbour who served in World War One. It lists 68 names. The unveiling of a roll of honour took place in the Sisters Creek Hall on Monday, and, favoured with a fine night, about 250 persons were present. After the singing of "Soldiers of the King" by Miss Wilson, Mr. S. W. Margetts made the unveiling speech, and Miss Olive French appeared as "Britannia' and unveiled the honour board which stood on an easel on the front of the stage. It disclosed the names of 57 young men who had enlisted from the district of Boat Harbour, Sisters Creek, and Myalla. Unfortunately, two names had been omitted (C. Hardman and C. King). 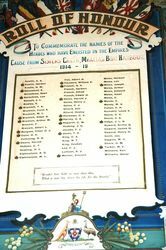 The roll of honour (which was the work of the "Examiner" and "Courier" staff) was greatly admired, and seemed to give general satisfaction. 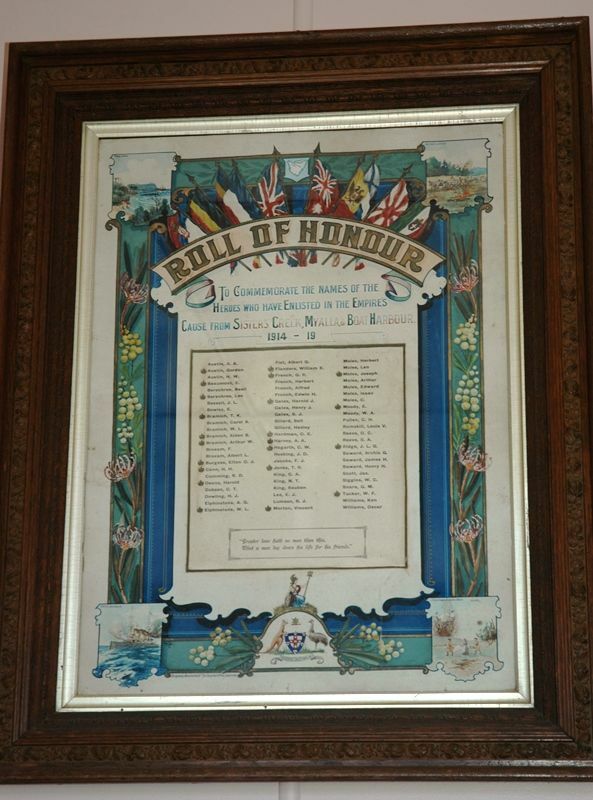 The main shield holding the names of volunteers, is surmounted by a scroll carrying the title "Roll of Honour." At the foot of the shield is the Australian coat of arms, with the device "Advance Australia." The whole design is surrounded with a heraldic border of waratah and wattle, and at each corner are views representing Table Cape, Australian battery in action, and Red Cross stretcher-bearers with nurse attending to the wounded. All the allied flags are represented. Examiner (Launceston) , 1st December 1916.